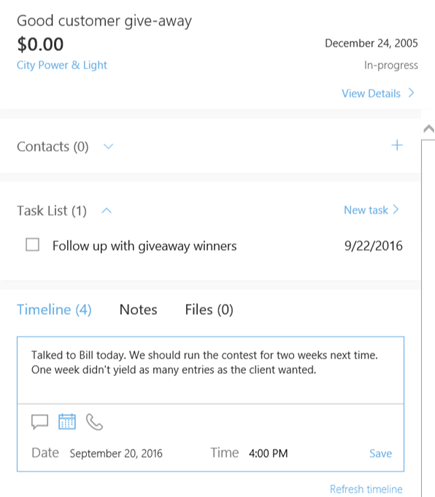 Outlook Customer Manager allows you to track a variety of activities and link them to deals, contacts, or companies. 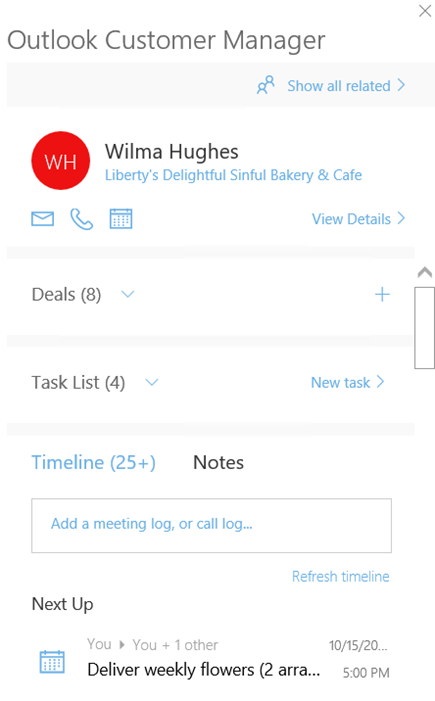 You can add meetings, create tasks, upload files, and enter notes from any item. With Outlook Customer Manager, any email messages you send to a contact are automatically logged. However, if you have other types of activities, such as meetings, phone calls, notes, or files, you can add those manually. Open a contact, a company, or a deal in Outlook Customer Manager. To add a meeting log, call log, or post, start typing in the box directly under the Timeline heading. For example: Called Kim at 3pm on Wednesday to discuss new deal. The default type of item is a new post, but you can choose the meeting or phone call icon instead. As you type, Outlook Customer Manager will try to detect the type of activity you're adding and propose an option. You can accept the proposal or choose a different activity type. When you're done entering your notes, choose Save. Note: Once you save the activity, it becomes part of the timeline. You can choose the activity at a later date to edit the details if necessary. You can also add other types of activities. To add a long form note, choose Notes next to Timeline. Start typing in the Add a note... box. When you're done, choose Save. Notes added in this way won't become part of the timeline, but they'll always be linked to the contact, company, or deal. To upload a file, choose the Files option. Choose Add File, and then select either Add File By URL or Upload File. Note: Files are stored in OneDrive for Business and SharePoint, so any changes you make to the online file will be reflected in the item stored with the contact, company, or deal. To add an email to a deal's timeline, choose the Customer Manager button from the email. Choose Show all related, choose the + sign next to deals, and start typing the name of the deal. Outlook Customer Manager will suggest matching deals. Select the appropriate deal, then choose Save.